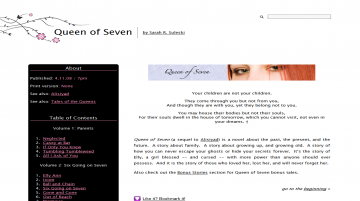 Queen of Seven (a sequel to Alisiyad) is a novel about the past, the present, and the future. A story about family. A story about growing up, and growing old. A story of how you can never escape your ghosts or hide your secrets forever. It’s the story of Elly, a girl blessed –– and cursed –– with more power than anyone should ever possess. And it is the story of those who loved her, lost her, and will never forget her. Note: Book One of the story is complete. On hiatus awaiting the start of Book Two. Queen of Seven has not been reviewed yet. Queen of Seven has not been recommended yet.